Back in the year 2005, Audi came up with its SUV Q7. The crossover SUV impeccably made the market for German automaker. The model with passing years kept on receiving one or another upgrades and it very well offered powertrains ranging from 3.0 V6 to 6.0 V6. And here they are in the year 2015 with the biggest ever upgrade list, presenting the Audi Q7 2016. Yes this time the company gave a good round of revision to not only cabin and tech parts but also to its exterior and engine options. 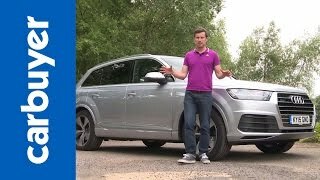 Let us have a look at the review of Audi Q7 2016 to learn more. 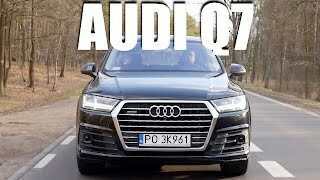 At first you might presume interior of Audi Q7 2016 to be shorter and narrower but the fact is it has some extra space in comparison to its predecessors. Starting with the changes in design, let us begin with the tall center console which replaces the previous heavy center stack with those traditional ac vents and knobs. The AC vents are now housed alongside (as in height) instrument cluster while the display screen now sits over dashboard. Sitting right in front of driver is a newly designed three-spoke steering wheel hiding behind it a digital instrument cluster. Moving towards comfort and luxury, the interior gets itself drenched in finest materials that give it a smooth finish and luxurious touch. Inside you’ll find leather, aluminum and wood trims marking their remarkable presence to make you feel serene. 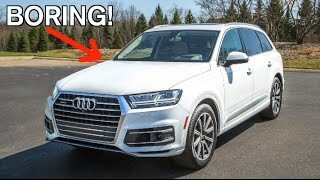 Last but not the least in the interior of Audi Q7 2016 we’ll talk about the new MMI system which now features almost anything and everything you need while the rear seat passengers have an option of going with two 10.1 inch LED tablets as monitors. The exterior of Audi Q7 2016 will narrate to you, how much dedication engineers and designers could have shown while working over it. The model gets bit of crispier and sharper touch to mesmerize you. Starting with the front fascia you’ll be noticing the parts resembling to the last year’s model. Let that be than the singleframe grille, the headlamps filling its neighborhood or the air intakes integrated in the bumper. Moving towards the rear end it carries many impressions from its past, especially the bumper and tailgate. However you’ll be noticing redesigned trapezoidal exhaust pipes. Unlike its interior (which has lots of space) the exterior of Audi Q7 2016 is narrower, shorter and lighter in comparison to its predecessors and this exceptionally adds star badges to its name. Beneath the hood of Audi Q7 2016 are three powertrain options, two 3.0 TDI variants and a 3.0 TFSI. The engines are capable of generating total output of 218 hp, 272 hp and 333 hp and peak torque of 500 nm, 600 nm, and 440 nm respectively mating to newly developed eight-speed Tiptronic automatic transmission. 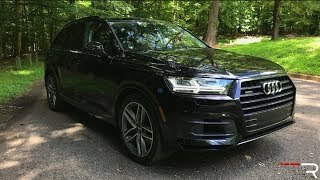 With these power figures, top speed of Audi Q7 2016 can touch the mark of NA, 145.4 mph and 155.3 mph while the 0-62 mph sprint can be knocked in NA, 6.3 seconds and 6.1 seconds respectively.